Looking for rich culture and tradition ? Morocco is one of the top 10 motorhome travel destinations for 2019. Go out for a visit in Fès, the oldest imperial city of Morocco, founded in 789. Visit its mosque, tanneries, the Boujloud door and many others. To park your motorhome in France : Service area of Saint-Cyprien-sur-Dourdou. Norway is very nice destination for motorhome, caravan or van travelers. Earth of ice and Vikings, it represents modernity and very often you will discover beautiful nature. In this country you can park without any problem if we respect the environment. Let’s ride to the North Cape and admire the view! To park you motorhome in Norway : Nordkapp Parking. To park you motorhome in Greece : Semeli campsite. Iceland is a nice destination for all nature lovers. During your trip, stroll through the glaciers, swim in the hot springs, hike the volcanic sites, … At the heart of the island, make a stop at the Landmannalaugar National Park, you may have luck and see a aurora borealis! To park you motorhome in Icelande : Landmannalaugar Parking. Looking for a rich “nature and discoveries” program ? Hiking, lakes, climbing, … “rendez-vous” in the Dolomites an Italian region. These magnificent limestone mountains are listed as UNESCO World Heritage. To enjoy nature, plan your stay in May, June or July. To park you motorhome in Italy : Service area of Tognola. Steep cliffs, majestic castles, mysterious legends … let yourself be guided by the sound of the bagpipes. Leave for Scotland, whisky country, one of our top 10 motorhome travel destinations for 2019. And more precisely on the mythical and magical Isle of Skye. To park you motorhome in Scotland : Parking Portree. Departure for the North of Spain in the Basque Country and more precisly Biscay region. Between sea and mountain, city and countryside, many activities are available for you and you family. Visit the Oma Forest, the Guggenheim Museum in Bilbao, the seaside town of San Sebastian and the small fishing villages of Bermeo, Getaria and Lekeitio. To park you motorhome in Spain : Lekeitio service area. Also called the Enchanted Valley, the Douro Valley is a UNESCO World Heritage Site. Stop by Peso da Régua at the Douro Museum. Visit the Lamego Sanctuary. Stop by the Pinhão train station. Keep going to Miranda do Douro and its wonderful church. Close you trip with Porto and its authentic neighbourhood, an opportunity to taste the “francesinha”, typical dish and a glass of wine (or porto). To park you motorhome in Portugal : Vila Nova de Gaia Parking. Ireland with motorhome or van is a beautiful destination for discoveries… You can choose to rent a vehicle out there or go there with yours. In this case, you will just have to take the ferry, don’t worry your RV will love to take some fresh air. We recommend Connemara region where nature and history are well preserved (as well as traditions). 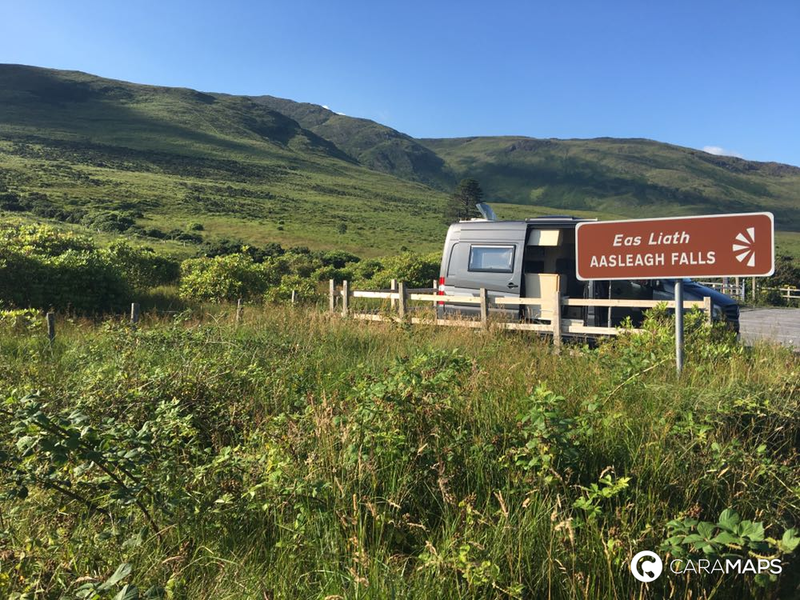 To park you motorhome in Irlande : Aasleagh Parking. With all those motorhome travel destinations for 2019, you are now ready to hit the road (jack and don’t you come back 🥳) ! Enjoy your motorhome trip with CaraMaps !